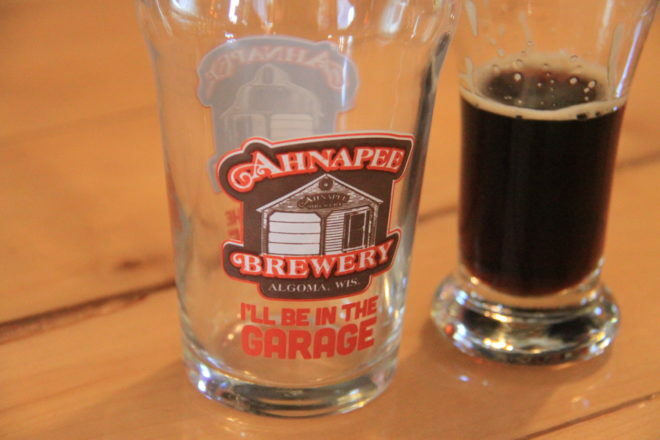 During the past few months the name Ahnapee Brewery began popping up in conversations more and more frequently. Several colleagues passed along praise of the local brewery and I recognized the name on more than a couple menus around the county. Feeling the need to be in the know, I decided that it was high time to take the drive to Algoma and sample this growing favorite. 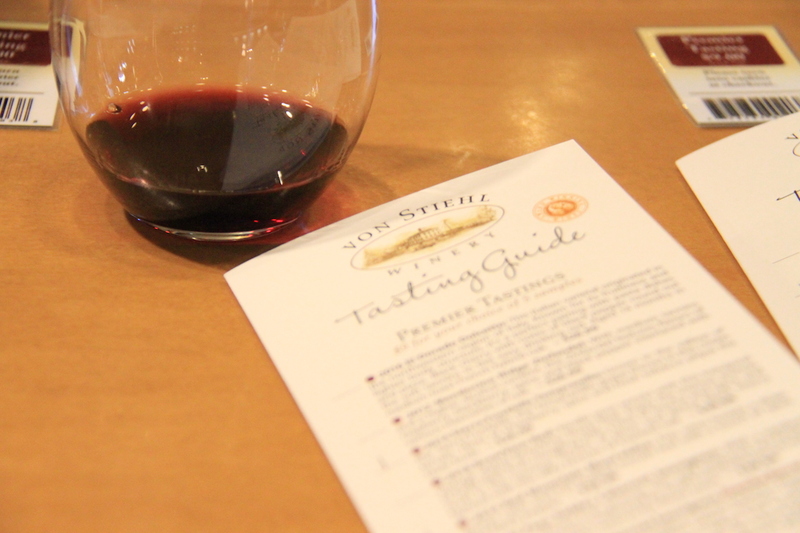 Upon arrival I discovered von Stiehl Winery is located directly next to the brewery, which happened to be another destination on my hit-list of places to visit. It made for a fantastic afternoon of tasting and discovering why Algoma is a growing hotspot for beer and wine aficionados. Given the glowing reviews I was surprised to find the taproom in a small, unassuming two-stall garage. I may have kept driving had the sign on the garage door not boldly proclaimed “Beer here!” While my expectations and reality did certainly contrast, it only elevated my curiosity and I had an inkling it contributed to the word-of-mouth talk that I already encountered. From the outside, I pictured strolling into a dark, old garage, but instead, I walked into a warm taproom that is actually rather spacious. The wooden L-shaped bar seats roughly 10 patrons and is surrounded by high-top tables, making for a comfortable place to settle in and taste a couple cold pints. Off the back there is a windowed sitting room overlooking a lawn that trails downhill to the Ahnapee River, which I imagine is a popular place to enjoy during the summer. The bartender provided a thorough rundown of the eight tap options while returning customers chimed in with their suggestions. After sampling several, my favorite was the Session Smores, a dark colored but surprisingly light and drinkable beer that features the flavor of roasted marshmallows, chocolate and graham crackers. According to the bartender, the secret to getting a full-flavored beer without chemical flavoring is to use the real ingredients in the mash, which meant, in this case, including many boxes of graham crackers and actual roasted marshmallows. The next small batch beer to be released will be called the Cherry Wood: a Baltic Porter aged on seasoned and toasted Door County cherry wood. Visitors can purchase by the bottle or case. 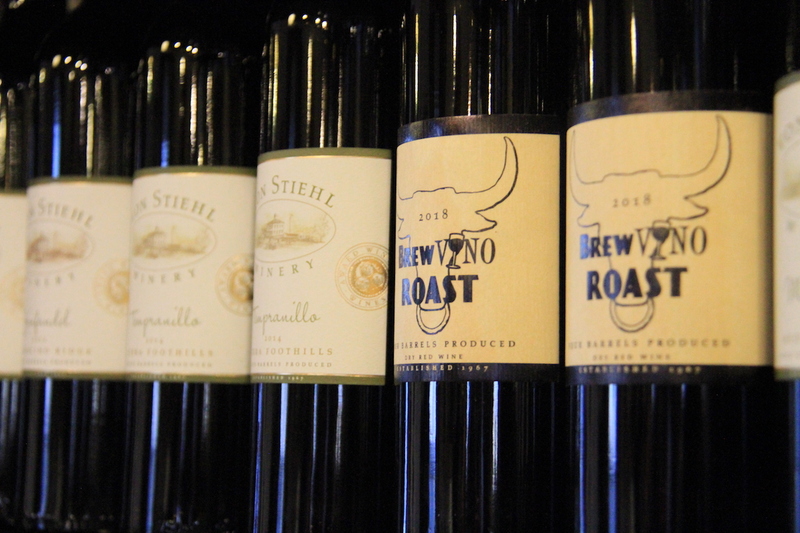 Neighboring the brewery is the von Stiehl Winery in a regal brick building dating from 1868. First serving as a brewery, the building pivoted to becoming a winery in 1967 when Dr. Charles Stiehl renovated the space to pursue his hobby of making cherry wine. Walking up the steps and into the tasting room, the structure makes a statement with its high ceilings and authentic industrial touches. The cheerful holiday decorations and twinkling lights added a festive element to the ambiance, and I nearly felt as if I’d arrived in a Hallmark holiday movie set. The tasting menu offers a “Select” or “Premiere” tasting. Finding a spot at the tasting counter, I was relieved to find the winery had come a long way from the days of cherry wine-making as I perused a sampling menu featuring a good number of wine varieties along with cider and cherry bounce. The staff was eager to help with tasting selections and relayed their ample knowledge with each pour, pointing out the grapes used, where they were grown and sharing some insight into what the wine should taste like and what to pair with it. My favorite pour of the night was the 2012 Mendocino Ridge Zinfandel. I was impressed with the rich, but soft, flavors of this wine; a hint of spice didn’t overwhelm the sweeter notes of raspberry and blackberry which were left lingering after each sip. Visitors circulated around the tasting room, sharing greetings and tasting notes. The fireplace beckoned me to sit and enjoy the tannins before moving on to another taste. Before my last sample, I was acquainted with everyone in the room and signed up for the Family Club winery membership. Whether it was the impressive wine or the cozy atmosphere, it’s safe to say von Stiehl and I have become fast friends and I’ll be going back soon. 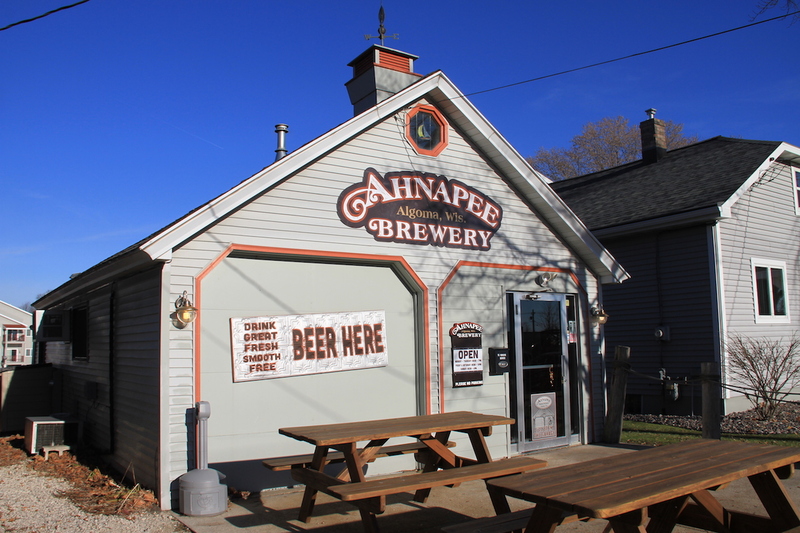 Both Ahnapee Brewery and von Stiehl are open year round, seven days a week, except holidays. The brewery opens at 12 pm and the winery currently opens at 10 am.